This is a larger size instant Pad Thai, each package makes two servings. So easy to make, yet the flavors are complex and full. Here is a real threat to the local Pad Thai vendor! Each pack comes with rice noodles and a spice packet. Add crushed peanuts and shrimp to make it even better, and garnish with a sprig of green onion & slice of fresh lime. Here are the instructions on the package: Soak the rice noodles in hot water for 2-3 minutes, drain. Mix the seasoning packet with 1/3 cup water. In a frying pan or wok heat 3 tblsp oil and add any meat of your choice (meat is optional). Put noodles and seasoning mix into frying pan and cook for 3-4 minutes. Add dried shrimp if you'd like. You'll love it! Large 5.3 oz dry weight per package. You get one very large serving with each pack, or two medium sized portions. If you don't want to go to the trouble of cooking in a wok, we still offer the original Mama instant Pad Thai which just requires adding hot water. See our complete Pad Thai series: Make Pad Thai From Scratch. Ingredients: rice flour, sugar, salt, peanut flavor (maltodextrin, peanut oil, soybeans, wheat), shrimp flavor (shrimp powder, salt), coconut cream powder, citric acid, chili sauce (sugar, tapioca starch, spices, salt, paprika oleorsesin, soybeans, wheat), chili powder, soy sauce powder, disodium ribonucleotides. Product of Thailand. 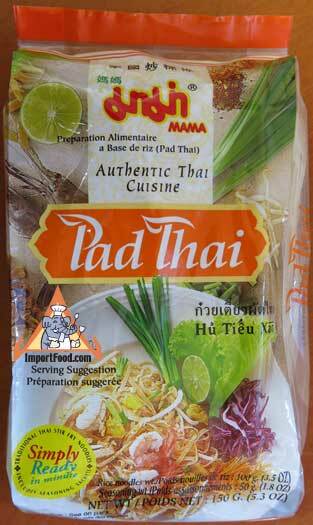 We also offer instant Pad Thai Sauce.